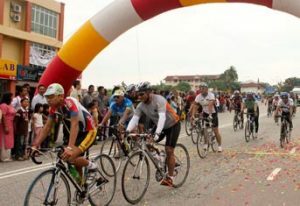 October 2010: Ireka’s Group General Manager, Leonard Yee participated in the ‘Make A Difference’ (MAD) Charity Century Ride 2010 which flagged off from Tropicana Golf & Country Resort Kuala Lumpur and ended at Kluang, Johor. By completing the 360 km ride, Leonard has managed to raise RM85,000 from his family, friends, Ireka staff and management as well as business associates. The monies will be distributed to various charities in Kuala Lumpur, Johor and Vietnam such as Myanmar Refugee Education Centre for Children, Budimas Charitable Foundation, Che Luan Khor Haemodialysis Centre and Sembrong Pertubuhan Kebajikan Anak-Anak Yatim Damo in Kluang, flood victims in Vietnam Central Province and orphanages in Ho Chi Minh City. Proceeds will also go to Ireka’s Benevolent Fund which helps staff and their families with urgent medical expenses.